Blend of 3 leaf origins from the top 10 tea gardens in the world. Rainforest Alliance Certified. Our finest blend Here at Yorkshire Tea we know that the best tea is about the best blend of leaves. 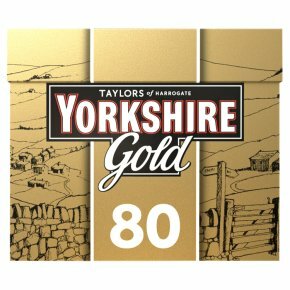 And the finest blend we make is Yorkshire Gold. We choose teas from our three favourite origins - Assam for richness and body, Kenya for vibrancy, and Rwanda for its beautiful golden glow - and we buy them from the top ten tea gardens in the world. Back home in Yorkshire, our master blenders bring these luxury leaves together to make a rich, smooth and incredibly satisfying brew.